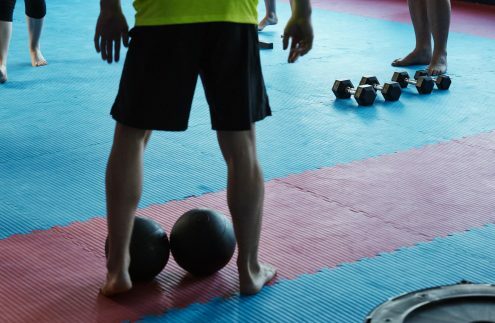 Launching in 2011 and fast becoming one of our most popular Fitness Based programs, JAI Fit is a total body workout that mixes Body Weight Training, Resistance Training and Kickboxing/Muay Thai. High Intensity Interval Training and Metabolic Conditioning ensures the body is working at a high work rate. The end result is maximum calories burned both during and after the workout. 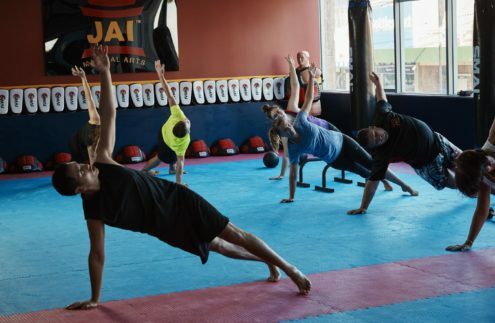 A variety of JAI Fit Styles ensures no classes are ever the same. Each is designed to burn fat, build lean muscle, and give you a TOTAL BODY WORKOUT in less than an hour. Suitable for all fitness levels, JAI Fit is fun, effective and will help you reach your goals. JAI Fit Classes include – Circuits, TABATA, Body Weight, Kickboxing, Kickboxing 2.0, Buns and Guns, Hybrid and Mystery Box Challenge. JAI Fit is held during the School Holiday Period, or by Private Bookings for 1 on 1, or small group fitness classes. Be sure to check Facebook or the club noticeboard for the next round of JAI Fit classes. Circuits: Follow the leader as you move from one exercise to the next. With up to 15 stations the entire body will be challenged. TABATA: 20 seconds of exercise and 10 seconds of rest sounds easy….but it’s not! The ultimate fat burning workout scientifically proven to burn calories both during and after your workout. Body Weight: This style of workout is all about YOUR body. You will be challenged with a variety of body weight exercises designed to burn fat and build lean muscle. Kickboxing: Kick, Punch, Elbow and Knee your way through a variety of exercise movements. We even mix in some body weight and resistance training to spice things up. Buns and Guns: All about Resistance Training. Weighted equipment and body weight are used to challenge muscles you never knew you had! Hybrid: 3 Stations of exercise – Resistance Training, Core Training and Muay Thai/Kickboxing. One of our most popular JAI Fit styles. Mystery Box Challenge: 10 exercises with little break, one of our most challenging JAI Fit styles. For more information about the benefits of this program click here.